Tonight’s post is nothing new. It’s a long forgotten bake from the archives. But as I’m feeling miserable and dreaming of summer days, I’m bringing these out to cheer me up. 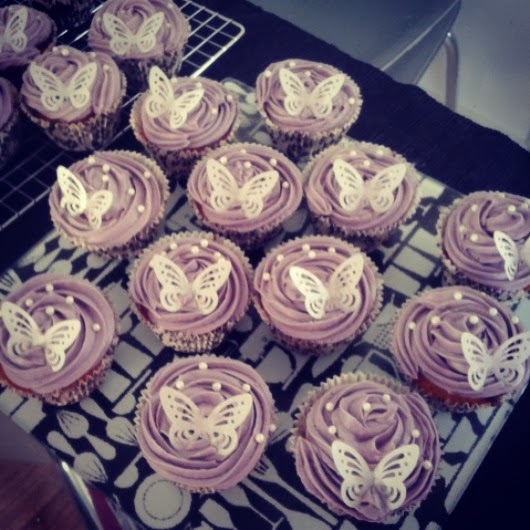 Last year, my granny/baking mentor/generally awesome old lady moved to sheltered flat. It may not have been under ideal circumstances, but her new home is an ideal social hub – she goes to exercise groups, plays bingo, has been to the cinema and for every resident’s birthday, they have a party. I was asked to make a cake for the occasion and as it was her friend’s birthday the next day, something suitable for the day after. A Victoria Sponge always goes down well– so I kept the cake simple – lashings of buttercream and Mackays Strawberry Preserve with Champagne as the filling. 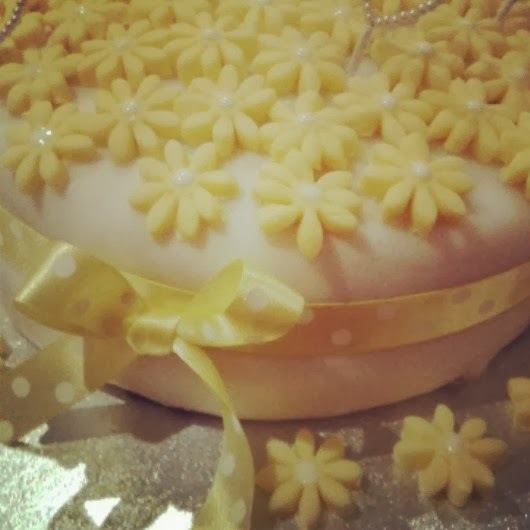 Fondant icing and yellow daisies were all individually pressed over the top, and then the cake was finished with a yellow ribbon to cheer everyone up. 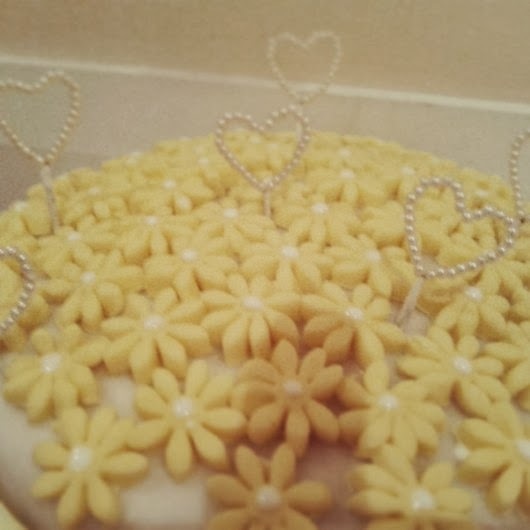 I bought some pearl hearts from Hobbycraft, which I think were meant for wedding flowers, but used them as a 3D decoration on the top of the cake. 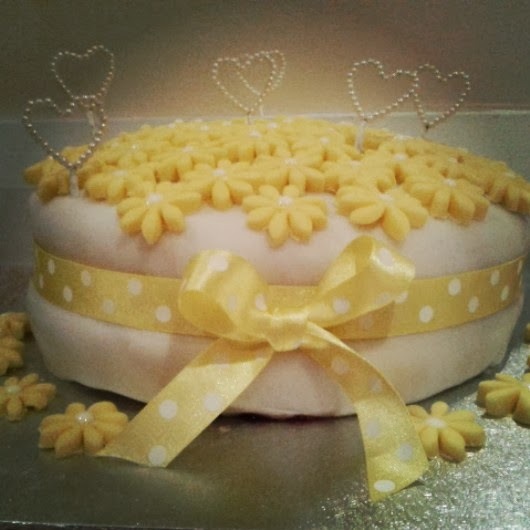 I used my Butterfly Birthday Cake recipe to make the cake and then decorated it from an idea I had in my head. I guess this post is less instructional and more about encouraging people to consider making an occasion cake. Two cake pans and the right ingredients will get you started. The cake has no additives or preservatives if it’s made by you. It’s personal and I can guarantee that the recipient will be touched by the effort you've made. Likewise, a muffin tin, paper cases, scales and ingredients will have you on your way to making cupcakes. They are by no means a difficult bake – heck, go for an all in one method if you are a novice. 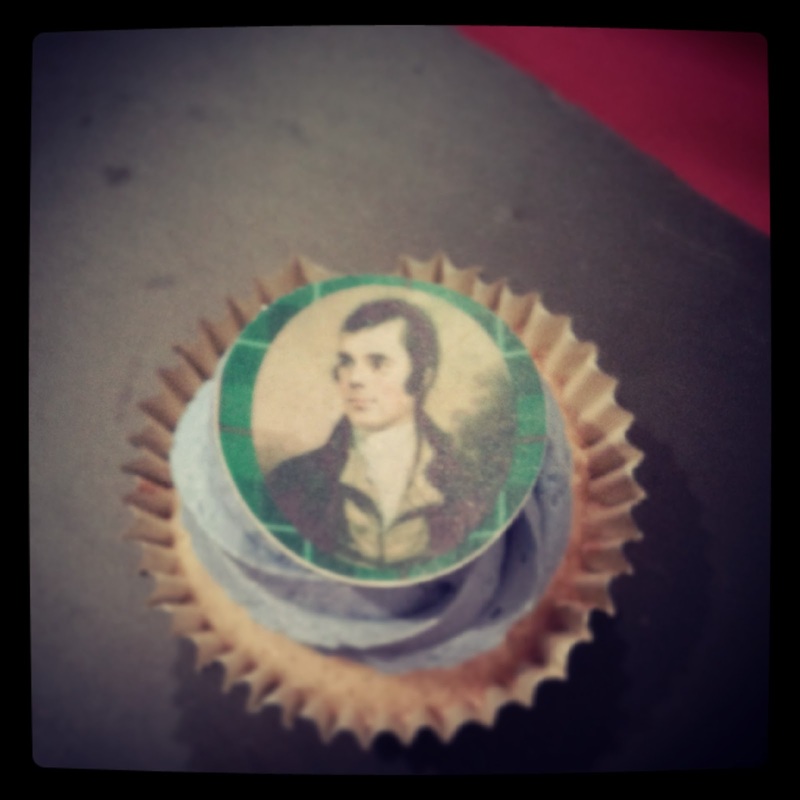 Or for the more adventurous, go the traditional route – there’s a cupcake recipe here for you to try. 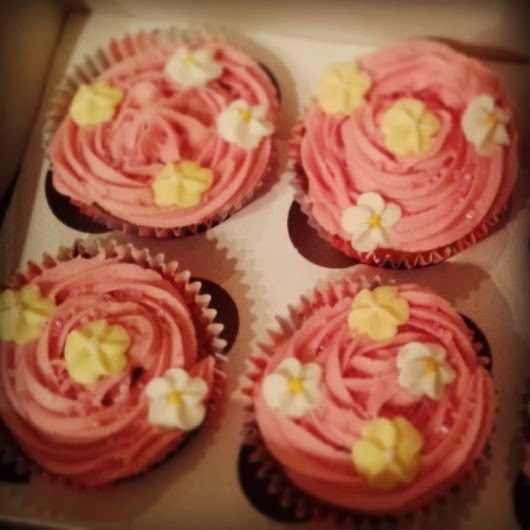 Here's the cupcakes I made for my Granny's friend. 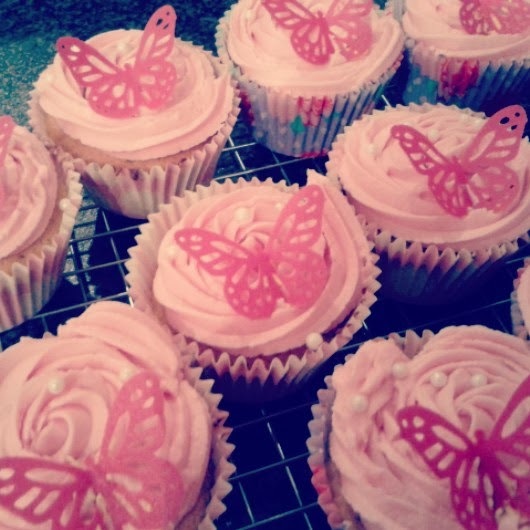 Simple vanilla sponge, pink vanilla buttercream, with a pink butterfly and edible pearls on the top. 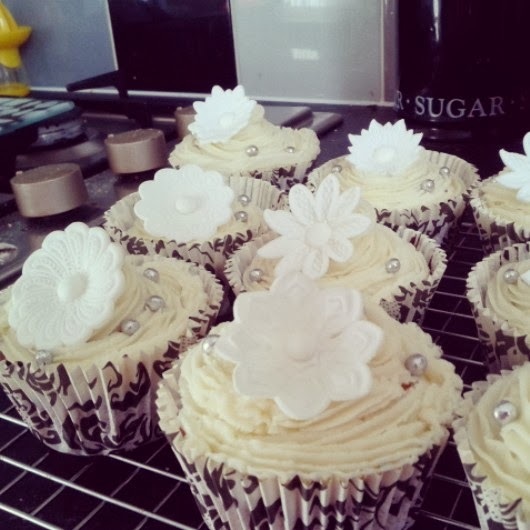 Decorate how you like – I've made everything from an Elmo theme, to flowers and garden cakes, to race car cakes and a wedding tea party for a colleague. Some may say cupcakes have had their day, but let’s be honest, there’s nothing nicer than handing someone a little bag of cakey deliciousness! Here’s some cupcake inspiration… enjoy! Ideal for Valentines, or those who hate piping!